Our programs are focused on helping children to be creative and give broader perspective which they lack in their confined environments. We motivate them to lead life with courage, confidence and creativity. Let the inquisitive mind remains ignited and handles every challenge with creativity and consciousness. We try to use the natural curiosity of children to create interest in learning. We follow TIAL framework to plug the gap which the present school methodology ignores. Help children to think about their immediate surroundings or in a larger constituency. We train minds to think, internalize the process to collate dissipate information into cogent thought; define problem-sets and linkup possible solutions. While thinking helps define the problems or issues and possible solutions, ideation brings in the elements of innovations, think out of box the ability to pick an appropriate existing solution or modify something existing to fit in the context, or possibly think of something entirely new. Ideation is a process we believe can be taught and we bring in a methodology for imbibing the same. The brightness of an Idea lies in its implementation. And putting in place any idea requires persistence, mobilization of resources and managing the eco system in which the idea is being seeded. 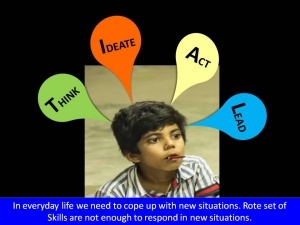 The process of flowering of an Idea into something concrete is what our approach teaches the children. Any action is worthwhile if it can be sustained and be scaled up. Leadership is encapsulated in a number of skills, may that be the ability to convince either through speech or writing, to be able to articulate cogently a complex thought, to be able to create new stakeholders in the action etc. We help put in place this know how in children. Empower children through education, skill training, health & livelihood.